On the masculine side, here's one for that sharp dressing man!! 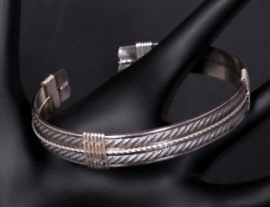 Sterling silver pattern wire has been antiqued to show detail, then hammered into an oval shape to work harder the wire and increase durability. Argentium wire completes the design. Open back. ~⅜ inch wide. Custom made for the best fit. Please write in wrist measurement when ordering.